Never mind the fuel I wonder what kind of hardware updates they'll have in a month. New injectors? New prechamber? New heads with revised ports? Higher compression pistons? It has gone awfully quiet from Japan. Means they are working assiduously. 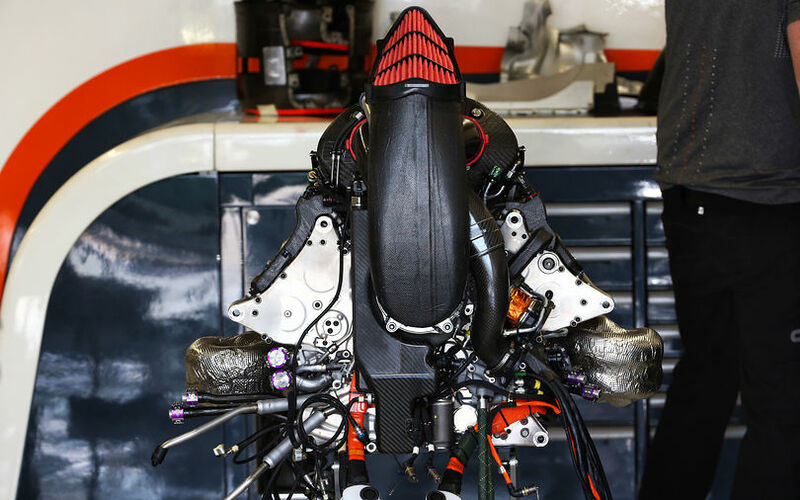 Either that or Honda have got to the point where the stuff they are putting into next years PU is advanced enough* that they want it all kept as secret as possible. Renault is understood to be planning a significant performance step for June's Canadian Grand Prix, which could coincide with the next major upgrade from Honda. This would present a key comparison between the two manufacturers' performance and development levels, if Red Bull has not firmed up an engine supply deal by then. Helmuk Marko is an old fox, to me the too open meeting between Honda and Red Bull is more to create some pressure over Renault than the real intention of changing of PU supplier for next Year. Honda is not on par with Renault output and unfortunately I have my doubts that Honda can have the necessary gains to move closer to the upper part of the field, and like it or not to Renault, is by RBR that they can say they have a winning P.U. We mustn't get carried away, Red Bull need to keep their options open as long as possible, so they're doing what they must do, and we need to see the updates from Renault and Honda. Honda are still behind as far as anyone can determine, but not far. There is very little talk about what's coming, and although we'd love some rumour and intrigue (! ), it's better than promising the world and then missing completely. In fact saying nothing and just turning up with a decent upgrade would really be the most sensible approach, and quite cool in a way. Or maybe there are no significant gains on the near timescale (noooo !). we need to watch the coming 2 updates during 2018. I haven't seen a significant power deficit quite frankly. Yes they're behind, but Honda is just finding their stride. It's a pimple faced teenager just entering a big growth spurt. That was in February and since then it has been announced that an engine upgrade for both Renault and Honda with a performance boost will be coming around Canada. The reliability of the Honda has been fine since they sorted out the vibration issue after Australia and so they are looking for more power. Renault said that their qualy mode is worst between 4. If Honda match with renault after second PU Honda will have Qually mode advantage over renault. In fact they already have it according to Abiteboul. I don't know how much tenths redbull will lost with current PU If they run a Honda PU they would be better at qualy which is important for Redbull's current situation. What is superoxide? Why is a spark from high voltage tension necessary? In other words what is created in the spark gap? Sorry but what? Maybe I'm going crazy but when did Abiteboul say that? I recall nothing of the sort. All he stated was that the Renault PU qualifying mode doesn't provide a huge increase in power compared to the highest race modes. Drastic difference. I'm all for Honda improving however sprouting random things (read nonsense) like this just spreads misinformation that people use as ammunition for when things don't got right. If Honda match with renault after second PU Honda will have Qually mode advantage over renault. In fact they already have it according to Abiteboul. That seems to be right. The Qualification mode from RBR is only 0,1 sec. Honda already has a better Q mode. If both engines get upgraded, that Q mode from Honda will still be better. Renault is not changing the Q mode. Sorry but what? Maybe I'm going crazy but when did Abiteboul say that? I recall nothing of the sort. Abiteboul said that on TV in a interview. Honda had last year already a Q mode, Renault didn't. I may hope you are not going crazy right now.